Bordered on the east by St. Petersburg and on the west by the beautiful blue waters of the Gulf of Mexico, Madeira Beach is a bustling destination for your next Florida vacation. Legend has it that a pirate named John LeVique was the first to “settle” in the Madeira Beach area, and today this popular site is full of wonderful things to do that will get even the most stubborn vacationer excited! 1) You can’t visit Madeira without stopping at the John’s Pass Village and Boardwalk. This sea-themed attraction features 1,100-foot boardwalk right along the Intracoastal, offering stunning views of the Madeira’s 2.5-mile beach. John’s Pass Village is full of unique shops and eateries that will entertain everyone in your group. 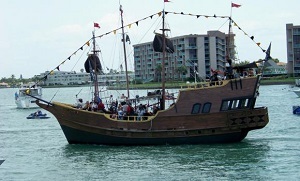 The kids will love the Pirate Ship, a two-hour boat tour event with games and free soft drinks. In October, the community hosts the Seafood Festival at the village, which is full of fantastic food and music and draws in nearly 130,000 visitors every year! 2) Fishing trips are a necessity on any beach vacation. Hubbard's Marina offers a little bit of everything to ensure you’ll find the perfect trip for you! The incredible Gulf of Mexico awaits for your trip; join in on a five, ten, or even 34-hour fishing adventure with guides that will take you to the best spots on the water to reel in that big one! Even if fishing isn’t quite your thing, stop by the marina anyway to indulge in a delicious meal at the world-famous Friendly Fisherman Seafood Restaurant or take one of their 1 ½-hour dolphin tours. Don’t forget to bring your camera! 3) The beach isn’t the only place to have fun at Madeira. Keep your feet firmly on the ground at Smugglers Cove Adventure Golf, a mini-golf course that’s surrounded by the waves and caves and even features live alligators that you can feed if you’re brave enough! Smugglers has been voted the Best Miniature Golf Courses in Florida by Florida Monthly Magazine, making it a stop that you’re sure to love on your Madeira trip. 4) Anyone looking for a bit of thrill should make a stop at John's Pass Watersports where you can easily find a variety of equipment and gear to head out onto the water for a fun-filled experience. They offer waverunners and plenty of boat rentals to make your beach vacation one to remember. 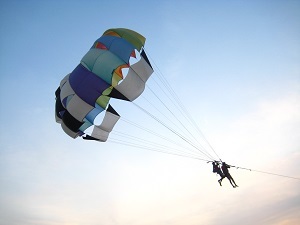 Working together with Gator’s Parasail, their parasailing opportunities are top-notch. You’ll enjoy birds-eye views of the Gulf of Mexico, Tampa Bay Beaches and the Intracoastal Waterway! 5) Florida Under the Sea is a great choice for a quiet afternoon or evening. This charming aquarium is located at the John’s Pass Village and features a variety of Florida’s marine life including seahorses, jellyfish, and stingrays. The kids are sure to love seeing all of the live “Nemo” characters, too! From the sand to the greens, Madeira Beach offers both fun in the sun and hole-in-ones. Don’t spend your time simply lounging on the beach or building another sandcastle; take the chance to explore some of these incredible attractions and experience what really makes Madeira Beach special! Your Home-Base to Endless North Coast Oregon Adventures!